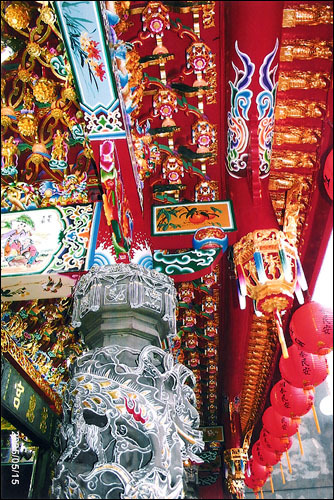 After Mazu’s migaration to Taiwan, the gilded images of Mazu, “Heavenly Holy mother”, settled down in this temple. 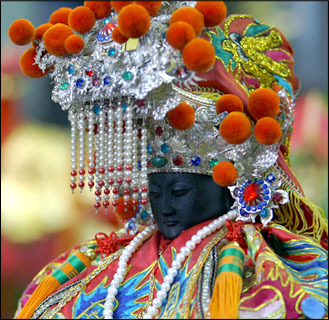 The followers experienced the miracles of Mazu. 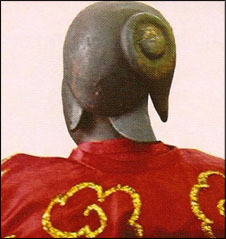 The belief in Mazu was thriving at this time. The temple was too small for the daily visitors; the temple needed to be extended. 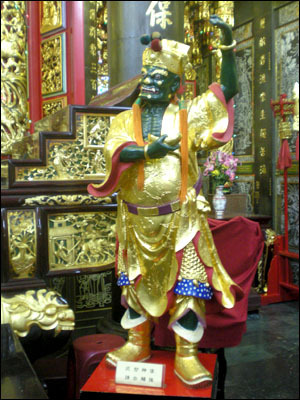 Mr. Lin Guo-fang, the richest man in Taiwan, suggested to Mr. Chen Yuan-rui, Mr. Lan-po, Mr. Yang Zao-ming and to others to build an extension on to the temple. The extension work commenced in 1873 and was completed in 1874. The new temple was magnificent and superb. In 1891, Mr. Lin Xin-chuan, the then manger of the temple, suggested to make the temple more palatial by raising the roof by 45cm. The construction expenses were donated by Zhangzhou people of Peitsie Fort. In December, 1895, the front hall was struck by lightning. The wall of temple collapsed, Mr. Lin Qing-shan, the then conductor of the temple, raised funds to restore the temple. The duration of the restoration lasted for 6 months. The restoration was completed in May the next year. In November, 1896, there was a spectacular inauguration conducted in the temple. 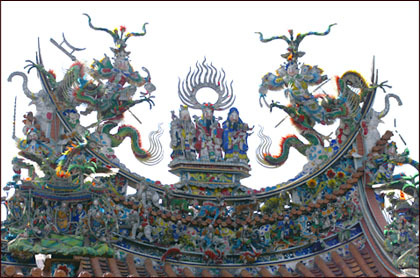 Ever since, the crowds of followers come to the temple to pray to Mazu for blessings. Master Engong, Master Yongchenzhen, Master Jinshan and Master Zhenming from Muzha, the temple abbot after the Taiwan Retroaction. The departed Masters’ tablets were placed in the holy shrine for the later generations to reminisce. In 1975, Banqiao executed the urban renewal plan. 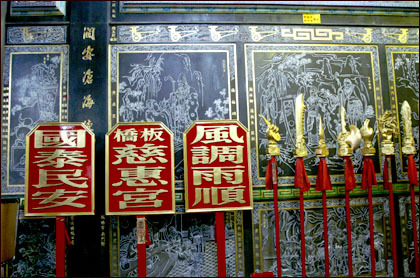 Part of the temple located in Fuzhong road was dismantled. 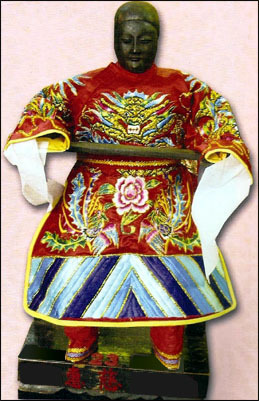 The then conductor of the temple, Mr. Zhu Mao-yang, contrived the allover recondition, and organized a recondition committee. Mr. Liu Wei was the chairman of the committee. A 2-story hall for Mazu in the front the 3 Deities of heaven, earth, and humans in the back building and a top hall for the Jade Emperor have been annexed to the temple after the recondition. The construction work commenced on the 15th of December, 1975 and was completed on the 20th of November, 1984. The construction work lasted for 10 years. Thebrand new 3-story temple is now resplendent and magnificent. 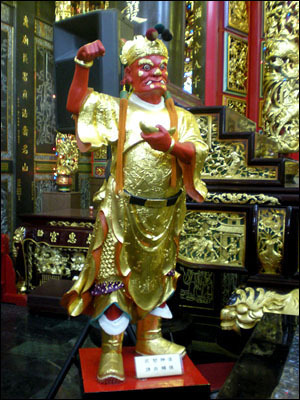 The temple will prosperous because of its followers and the strong and constant commitment to the belief in Mazu.